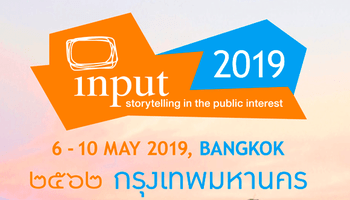 From 6 to 10 May 2019 the INPUT conference in Bangkok will offer surprising, simple, encouraging and stimulating answers to a challenge that is of concern to all of us: How do public broadcasters around the world stay relevant for their audience? In 27 sessions composed and hosted by tv experts from Canada, Denmark, Finland, Ghana, India, Japan, Switzerland, Sweden and the United States INPUT Delegates will be able to learn from the success and failures of their colleagues who made the 87 programmes selected for screening at INPUT 2019. This year INPUT also focuses - for the first time ever - on FICTION. The opening screening of ‘Berlin Babylon’ - in many respects a possibly record-breaking TV series from Germany – will be followed by at least one TV Fiction session per day, dealing with the handicraft of successful comedy, the power of silence, storytelling for young people, the pertinence of period drama, the importance of choosing the right point of view for telling a story and more. You are more into factual programming? 14 sessions tackle very specific issues that anyone involved in factual filmmaking will have come up against. To start with, the question of perspective will be illustrated in two very different films on the international effort to rescue the 12 boys and their coach from a remote cave in northern Thailand. Other factual sessions will discuss the filmmaker’s responsibility for her/his subjects, present innovative approaches to portraits or analyse consequences of tackling hatred on tv. On Friday morning four programmes will demonstrate how to make science entertaining followed by a session on reality based tv formats. Warning: this will be very real in parts…. Should I Stay or Should I Go? is the question our social media experts ask on the pros and cons of being present on social platforms. They will also show us World Wide Wonders, presenting the greatest examples of digital storytelling in public service around the world and offering an outlook of where the public media journey might be going. The Conference will open on Monday 6 May, at 14.00 for the registration of Delegates and the Welcome Reception in the evening. Conference Location is the Royal Orchid Sheraton Hotel, on the riverside of Chao Phraya. The screening and discussion sessions will run from Tuesday, 7 May to Friday 10 May, all day. The detailed programme for INPUT 2019 will be online 1 April. Online registration, information on conference hotels you can find here. Please check visa requirements for your country. The INPUT 2019 teams in Bangkok and Berlin are looking forward to welcoming many of you in Bangkok in May!